Whether is is strapped around a tunic, make-shifting as a belt for your favorite pair of trousers, or giving a dress some shape in the waist, never underestimate the transformative power of the belt bag. Yes, my style mavens, you are in fact seeing an ensemble that I have featured before. However, before you cue the violins of blogger shame, please hear me out on why I chose to don a certain look more than once- even typing this gives me an uncontrollable tinge of sudden dread. Have you ever styled up a look, but felt that there was always something a little off about it? Just like any displeased artist in their craft, this dress seemed to be the one that always haunted me, because I felt there was just something missing, and I must say that this belt bag – formerly known as the fanny pack- was definitely it. The suspenders are awesome and loved that you paired them with stripes!! You look awesome! I do love this top! Too bad it is sold out – whomp whomp. Ain’t no shame in your game! Do you. Also, wind is the biggest reason why I almost always wear my hair in a bun for photos. I’m glad you wore it again, I love it! And looks perfect with the belt. I have been thinking lately that I need to invest in some good belts, they really do add the final perfect touch. I agree! So many people forget the power of the belt! That suspender dress is a killer- and I love it with the hip belt! So chic, lady! 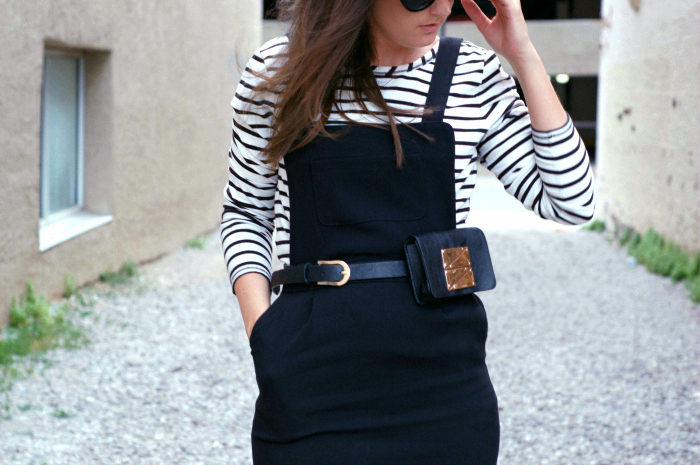 Love everything about this look and a belt bag never looked so chic! love love looove this look! I want it so badly! Just happened to stumble upon your blog and am lovin your style! This is one of your best looks! I adore the skirt, and that bag is pure perfection! Thanks! I love the fanny as well!